I have no idea what's up with mother nature but the birds today at my feeders have been crazy! 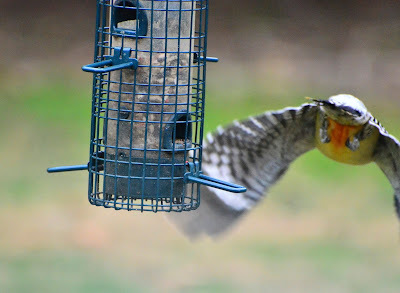 Dozens and dozens of finches, juncos, hairy woodpeckers, sparrows and doves fighting at the feeders and the seed below. So weird! And it's a dark, drizzly day as well. They've totally emptied my sunflower feeder today! 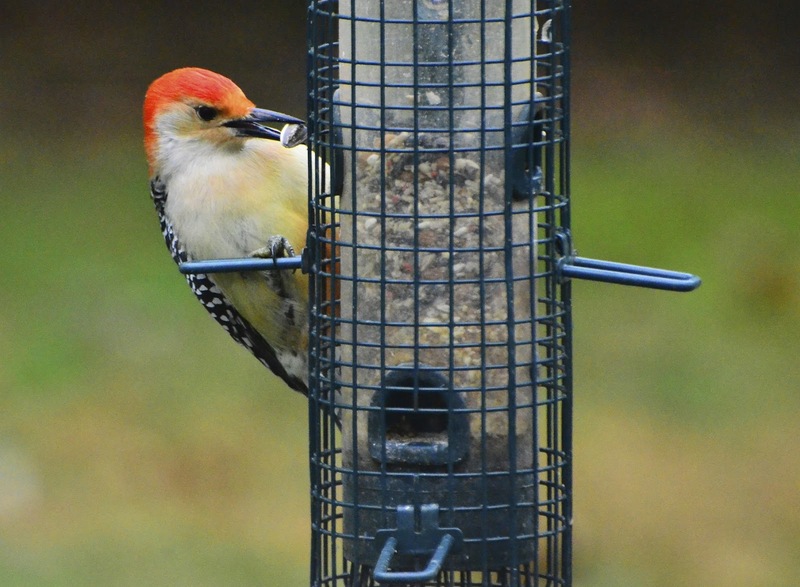 I love them all but my favorite visitor is the Red-bellied Woodpecker. 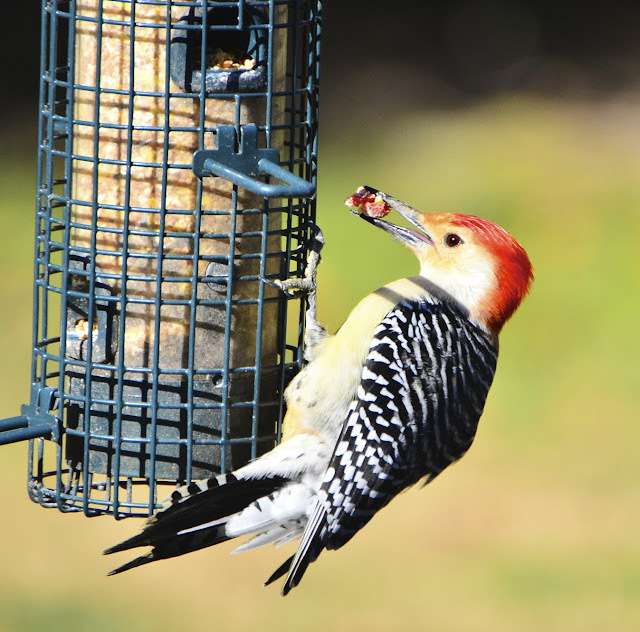 His colors are delightful with his checkerboard-like feathers and his soft white underbelly. And he reminds me of Donald Trump with that red doo on top! charming and striking in his attire. I'm never sure if it is the same one all the time. But he's one handsome fella. hung around a bit and at first I didn't notice the difference until I downloaded the photos. I had not seen her before. Only the male. She never approached the feeder like the male does. for at least 15 minutes. The male, on the other hand, is certainly not shy about feeding. In fact, he's down right finicky in what he chooses to feed on. He seems to like the big pieces of fruit. He just tosses them out! At least the squirrels and doves have a feast below! But nothing seems to please him more than when he comes upon a big almond! Guess he's on the Almond Diet. I bet his LDL numbers are outstanding! By the way, what is your favorite bird at your feeders? Curious me wants to know. 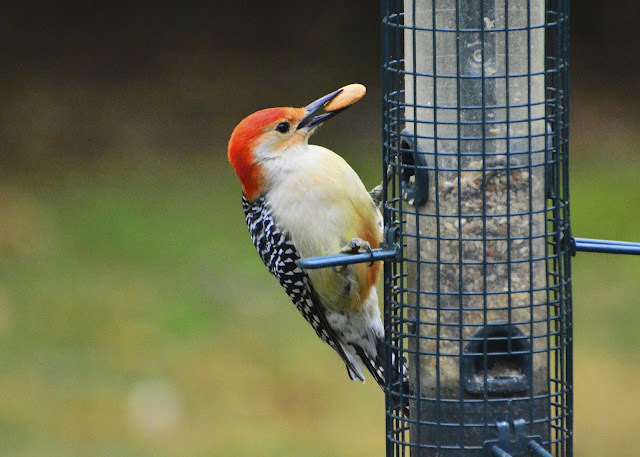 And why oh why do they call this guy 'red-bellied' woodpecker? It's a beautiful bird to see. Me, too! I just love those colorful fellows. 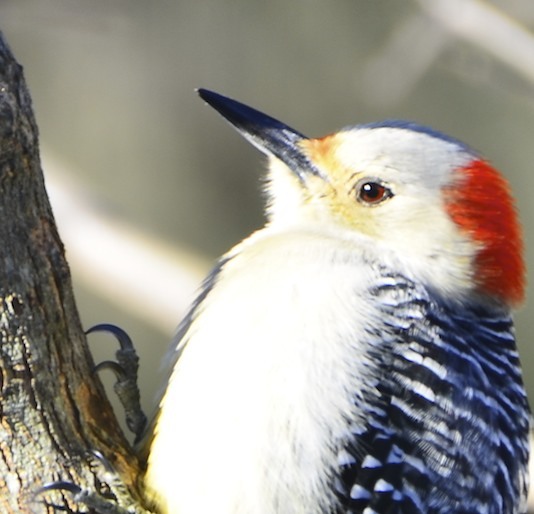 The only one who beats them is the grand-daddy of peckers (hehe), the Pileated Woodpecker! He's gorgeous, Reena! The birds went crazy at our feeder last week-end during the blizzard. You could barely see them through the snowstorm, but they were all over the feeder and ground beneath it. Probably 30 at a time. Must have something to do with the weather when they all flock to a feeder. Oh what a beauty. I could hear a tap tap tapping outside my spare room window earlier today. Camera in hand, I very carefully slid one window open.. then the next glass and had only the screen to move when he was alerted to my presence. No photo op but a sweet moment nonetheless. Clearly, you're far more successful in capturing this lovely. Nicely done. We've had Acorn and Downey Woodpeckers visiting the feeders more recently and your pictures have inspired me to try for some photos of them. Very nice. I do love your colorful friend, Reena! It's been many years since I was able to have a bird feeder, so I really enjoy seeing yours. Such wonderful, delightful captures! Thanks for sharing the fun and the beauty! Have a terrific weekend! I used to have one that came to my feeder when we lived in the country. I always had suet for him, or if I had left over fat and meat, I would put it out for them. You got some great closeups. Gorgeous captures, I always wondered why they called them red bellied too! Have to say my favortie remain the titmouse. They are always so full of character and I just love their little mohawks. 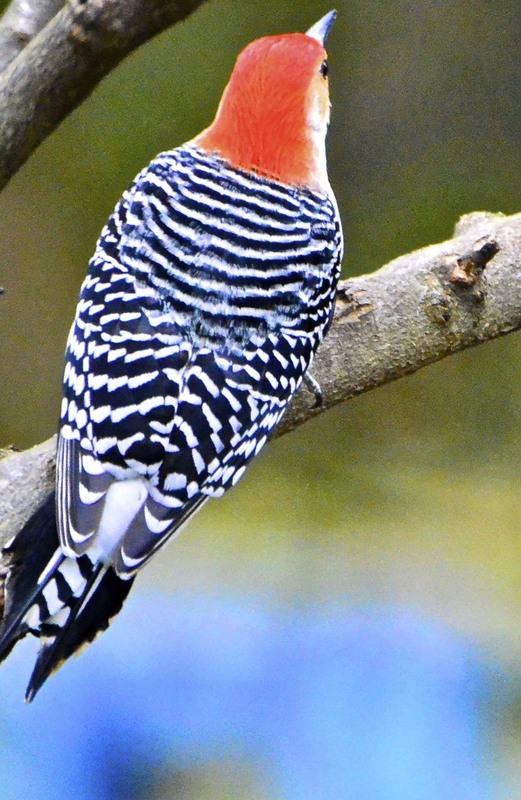 I love the woodies, great shots of the Red bellied Woodie. I hope you have a great weekend! It was a yucky day today, but your 'woody' brightened things up! Your birds are well fed! 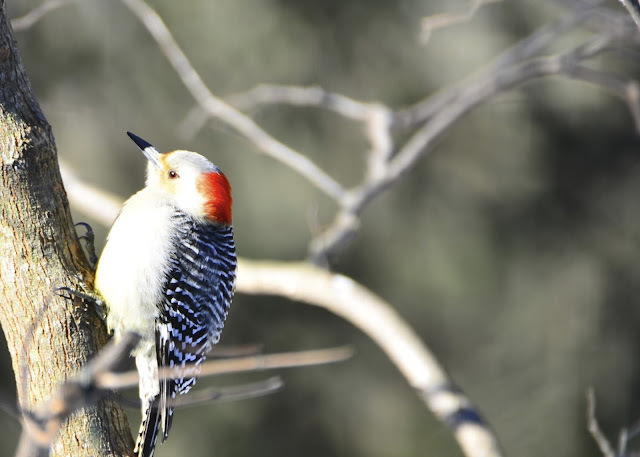 About the only birds I get any more are Gila Woodpeckers. I love them but they cackle like crazy and eat all my hummingbird food. Also, they are VERY skittish, making photographing them difficult. We used to have hummingbirds feeder. It seems silly to ask-how do you avoid all the ants that are attracted to the sweet feed? I heard on tonight's national news that the South and the East Coast is getting ready to be hit with some really severe weather. I think birds and other creatures have heightened awareness and instincts about such things so I would just bet that they were stocking up at your feeders in anticipation of nasty weather in the near future. I am confused by some bird names too. 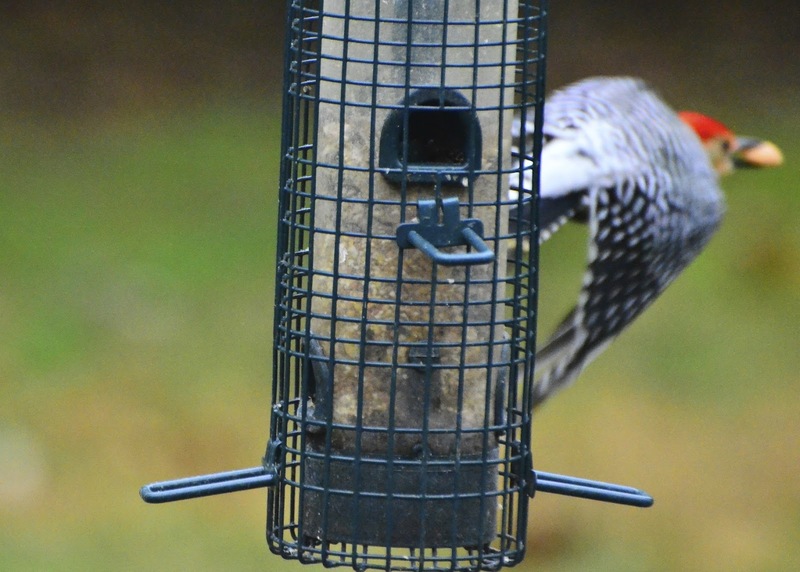 We have a red shafted flicker here that is very good looking and rather finicky about his food,but my favorites are the anna's hummingbirds that stay year round. That really is the most amazing pattern within the feathers. Particularly loved your 6th shot. Men die for money, and birds for food. that is interesting behavior by the female...will have to talk to some of my more knowledgeable friends...great pcis as usual..do you have a bird cam attached to something near the feeders? Beautiful photos! I could never understand the red-bellied name either! 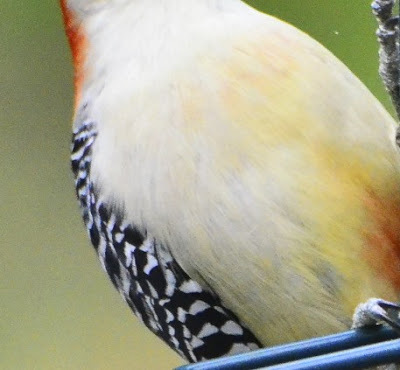 I only had a woodpecker at my feeder once, I love when Cardinals come to our feeder. I love seeing them come to my feeder, which btw I need to fill. Wonderful photos. Oh, I have bird envy! There's a woodpecker in our woods, but I've only caught glimpses of him and blurry photos. He won't come to our feeder. My favorites? The Mexican jays - gorgeous blue feathers. Such a beautiful bird. I agree with him. Almonds are much better than sunflowers. Great photos! Such a beautiful bird. That is to funny that he is such a picky eater! Some really great captures here, I always enjoy looking at your photos. 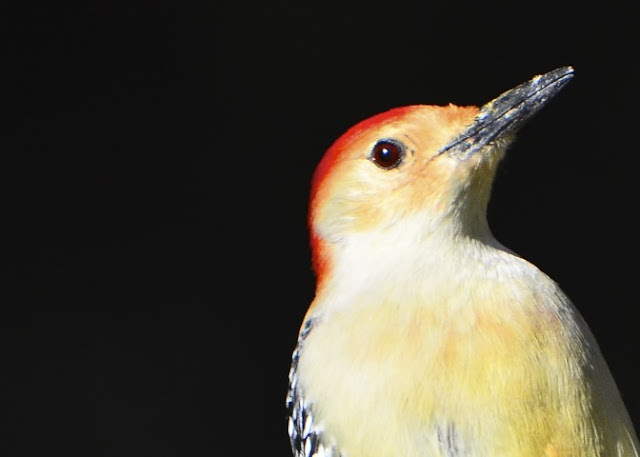 It's a beautiful photographic study of the woodpecker, Reena!! How in the world do you achieve those fabulous close-ups? 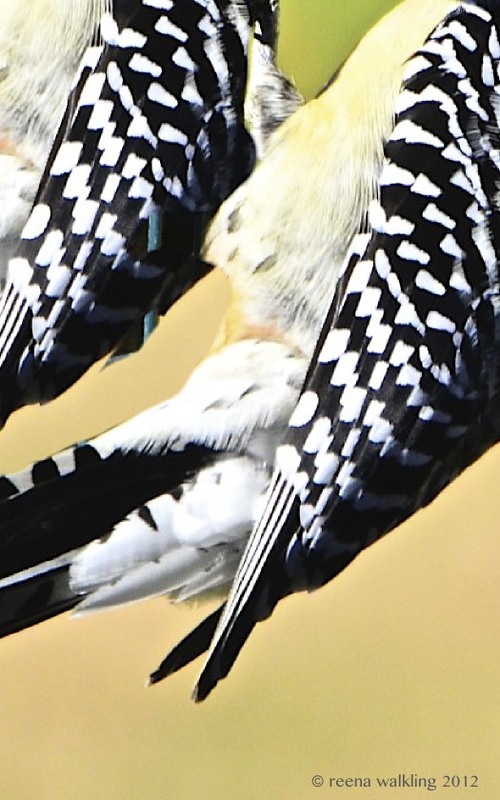 These are great captures of the Red-bellied Woodpecker. I usually see the female at the feeder- seldom do I see the male. I have seen one freeze in place for about half an hour when there was a hawk nearby. Gorgeous, wonderful pictures!! Especially the close-ups of the checkerboard pattern. The female almost looks like a juvenile! Maybe she is puffed up because of the cold? They don't call them red-headed because there is already a red-headed woodpecker and his whole head looks like it has been dipped in red paint down to the neck. I guess some of our favorites are the chickadees. None of my REAL favorites come to the feeder yet. They are all such characters it's hard to choose a favorite. Possibly the purple finches which are rare. Such a sweet woodpecker! Right now the nuthatches are my favorite at the feeders. They love the sunflower seeds and I laugh that they dig through them to find just the right seed too! Ha! Of course, here in Saskatchewan, it's only them and the sparrows at the feeders until the spring and summer birds return. They're so beautiful!! Love the colors...reminds me that spring will soon come! Mom's fav too...but then if it is wearing red Mom loves it. Because his belly really is red. 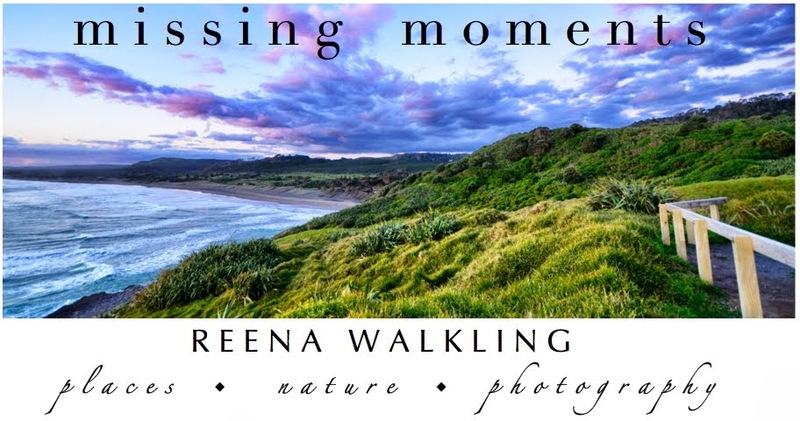 Outstanding captures this handsome fella, Reena. And I love that last one where he's flying away! Geez, my favorite bird at my feeders? It's probably the same as yours - the striking red-bellied woodpecker. Love that pic of the back- never saw it straight on like that, I think. What wonderful shots my friend.. That last two are such great captures..
just this week in florida, the robins, wood peckers, doves, sparrows and juncos have been thick. are they starting to migrate north already ? He's one of my favorites too!! It would be VERY hard for me to chose a fave at the feeder .... but the cardinals have a special place in my heart. I have my house up for sale. The house I want to buy is perfect for bird feeders. Do you take these photos from inside your house... through a window?